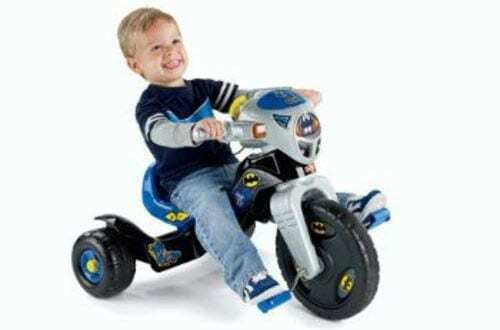 Tricycle bikes bring enormous fun to both toddlers and preschoolers. Besides allowing them to get from one place to the other, Trikes also helps kids develop gross motor skills and build independence. 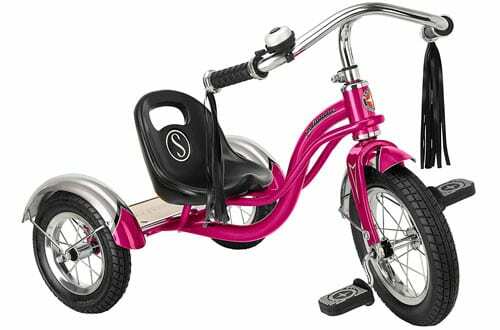 While most kids can learn to steer and pedal at the age of around three years, various Trikes will work well with kids young as 18 months! These tricycles have been designed carefully to ensure that your kid rides smoothly in the outdoors and indoors. 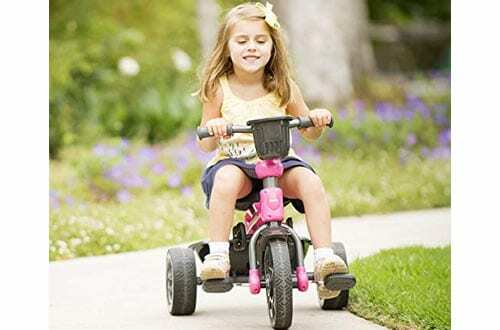 In our review of the best tricycle bikes for kids, we have only included the models that are sturdy, durable, and easy to ride. Therefore, by purchasing any of the following models, your kid will definitely remember their first riding experience and create remarkable memories of their childhood. 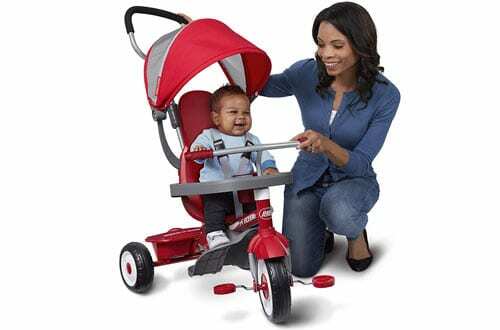 The 4-in-1 Stroll ‘N Trike is the ultimate grow with kid trike that is designed to offer four ways to ride. 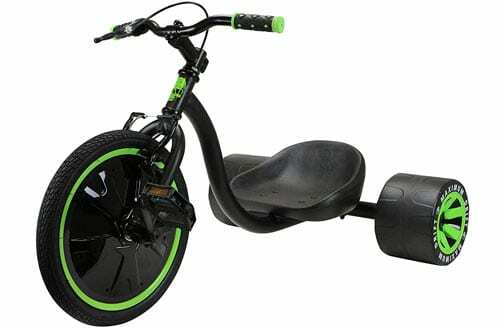 It is designed to easily convert from an infant tricycle to a steering strike, an easy to ride the tricycle and finally to a classic trike. In terms of construction, this unit is a masterpiece. It features advanced features and high-end construction ensuring high performance, safety, and ease of use. Some of the features that you will love about this unit include the UV blocking canopy, large wheels that ensure a smooth ride. A three-point harness for safety as well as a removable footrest. Besides, owing to its sturdy steel frame plus ergonomic seat that is adjustable, you can rely on its performance for many years to come. 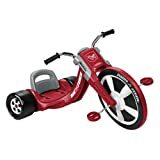 The Radio Flyer Deluxe Big Flyer is an award-winning tricycle designed to offer your kid with everything they need to learn motor skills from a tender age. 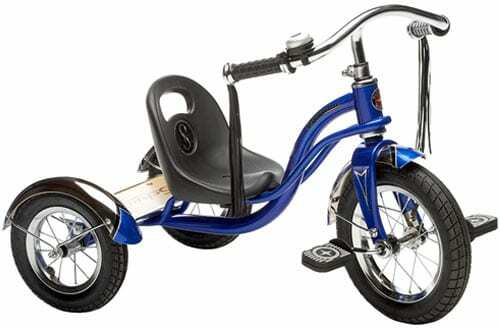 This trike comes with a sleek racing an ergonomic design making it stand out from the competition. Dissimilar from other models, this unit comes with larger wheels with high-performance grip thread that ensures a superior grip on all types of terrains. Additionally, we love the adjustable seat that grows with the kid and the ergonomic handlebars that ensures easy manoeuvre. 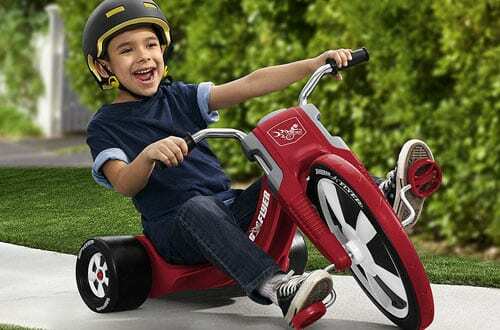 With the Schwinn Roadster Tricycle, you will make your kid’s childhood memories last forever. 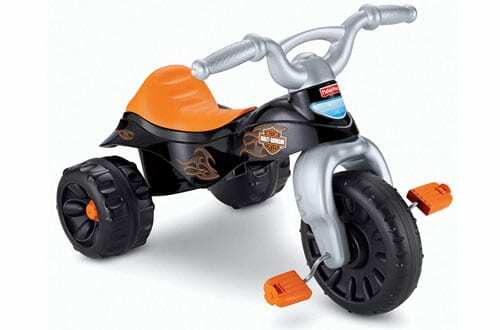 This is a retro-styled kid’s trike that is designed with a low centre of gravity. This makes climbing and going slopes safe and easy thanks to the improved stability. The chrome fenders, adjustable seat, moustache styled cruiser handlebars as well as bell will also add a nostalgic friar that parents will appreciate while the sleek design will make the kid stand as they roll smoothly down the neighbourhood. The exciting voice phrases, flashing blinkers and action sounds are some of the advanced features that your little champion will appreciate from this tricycle. More to this, we love the kid’s friendly design that features an oversized front wheel that enables the kid to pedal faster, easy-grip handlebars as well as an adjustable seat. Additionally, for enhanced safety, this unit comes with a wide wheelbase that increases its stability. Designed for kids as young as 18 months and having the capacity of holding up to 44lbs, the JOOVY Tricycoo 4.1 Tricycle has taken the game to the next level. 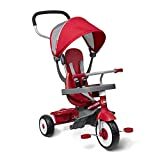 This tricycle comes with a fold-down footrest, removable baby surround arm that ensures protection for the young kids, and flexibility as the kid grows older. 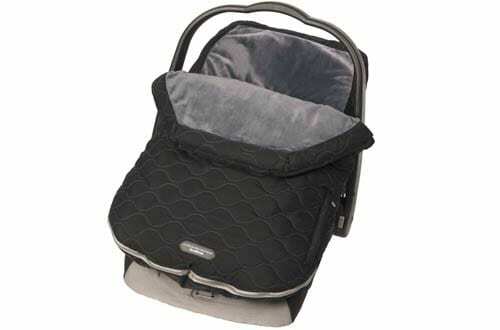 Above all this unit comes with a parent push handle, which is removable, all-terrain wheels, and an adjustable seat. Featuring a simple design with a low centre of gravity, the Schwinn roadster trike will surprise you when it comes to its performance. Its simplicity combined with high-end construction allows your kids to ride smoothly and gain motor skills from a tender age. The seat is well sculpted and comes with five adjustable positions, ensuring that it grows with your kid. In addition, you will love the classic design that features a chrome handlebar and a real wooden deck that makes it stand out. If you are looking for the most fun that your kid can have on three wheels, then the Madd Gear Drift tricycle is a great choice. Featuring a unique bucket seat that is adjustable, these trike wills allow for easy customization that allows the rider to reach maximum drift. This is also improved by the sturdy rubber front tire and blow moulded rear tires that will keep you spinning at 360 degrees while maintaining forward momentum. Combining the low centre of gravity, steel frame plus ergonomic handle, your kid will not only ride safely but also have more control. 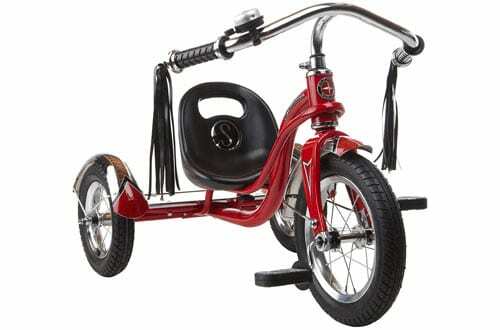 Coming in a vintage design that features a glossy red steel frame, flowing handlebars tassels, and chrome bell, this tricycle will turn heads wherever your kid goes. Besides the aesthetics, the classic construction will offer a sturdy and dependable ride. The trike also comes with rubber tires that ensure a smooth ride on all terrains as well as an adjustable seat that grows with your kid. Similarly, the user will love the double deck that makes climbing on and off easy. 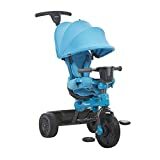 Having been made by one of the most popular brands that prioritize its efforts in making high quality and safe equipment for kids, this trike will take your kids wherever you go. One of the main selling points of these models is the cool features such as secret under seat storage compartment, wide stable wheelbase, and easy handlebars add to the fun. In addition, the rugged, durable tires, big foot pedals, and comfortable seats will offer many miles of smiles. Bigfoot pedals make it easy for little riders to get rolling. 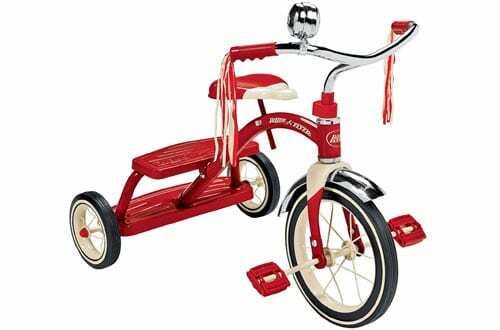 Similar to the original Schwinn bikes, you can count on the performance that comes with this tricycle. It boasts of a retro look that has a low profile that ensures enhanced stability. The rubber wheels will also provide superior cushioning that ensures a smooth ride even on bumpy paths. As if this is not enough, this unit comes with a wood rear deck, scalloped chrome fenders, as well as a five-position adjustable seat.